I thought I should introduce myself even though I don't really like introducing myself. My name is Amanda, I am first and foremost a mother of soon to be three (four with my stepson) beautiful and interesting children. Then I am a creator. I have a BFA in Interior Design with a focus on sustainable design from The Art Institute of Portland. Before pursuing my design degree I studied German and Music at Oregon State University before graduating with a BA in women's studies. Prior to and during that I lived in Switzerland, Germany, and England and had planned to go to school to study theology before getting the rejection letter from the prestigious private school I had my heart set on. In 2017 I started Motherhood Magazine. 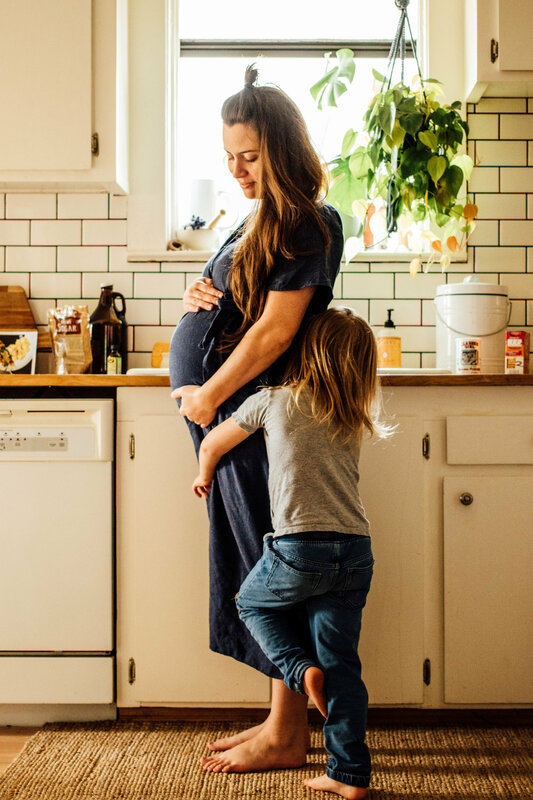 A periodical for the Gorge/PNW focusing on mothering in this corner of the world. When I am not working on that or design work with Samantha, I am doing my best (most days) to give my kids a beautiful and wild life. My 105 year old fixer upper does not look like my fantasy magazine worthy home. There is crayon on many of my walls, kids art hung all over the place, plants that usually want more water than they are getting, chickens in the yard, and always a pile of something, someplace. That is home and that is real life. Since I own a business and work as a designer while pregnant and raising 2-3 kids, the only hobbies I can stick to at the moment are listening to podcasts and gardening - and that's good enough. I'm happy to have joined Samantha and the Strucksured team to help bring functionality, beauty, and environmentally conscious design to my home town. "A person will be called to account on judgement day for every permissible thing he might have enjoyed but did not." Samantha popping on here to also add -- Amanda has been such a phenomenal person to bring on board. Her background as a designer and experience working in Portland have been a tremendous asses to StruckSured and we look forward to seeing what great design work will come from Amanda's desk. I propose one big virtual toast to Amanda and her joining the team. We all consider it a great honor to get to create beauty in the built environment and it has been a joy to get to know her and call her part of our tribe! Cheers!